The brushpot is fashioned from a hollowed irregular boxwood section with a slightly indented ridge along its thick mouthrim. The exterior of the brushpot is carved in high relief with five scholars and their attendants in a winter landscape. The boxwood is patinated to a deep caramel tone and rests on a shallow hongmu stand elevated on three bracketed feet. A similar brushpot is illustrated in the National Palace Museum’s Uncanny Ingenuity and Celestial Feats: The Carvings of Ming and Qing Dynasties Volume1: Art of Bamboo, Wood and Fruit Stone Carving 國立故宮博物院匠心與 仙工：明清雕 刻展, 2009, pp.104-110, Catalogue No. 24. 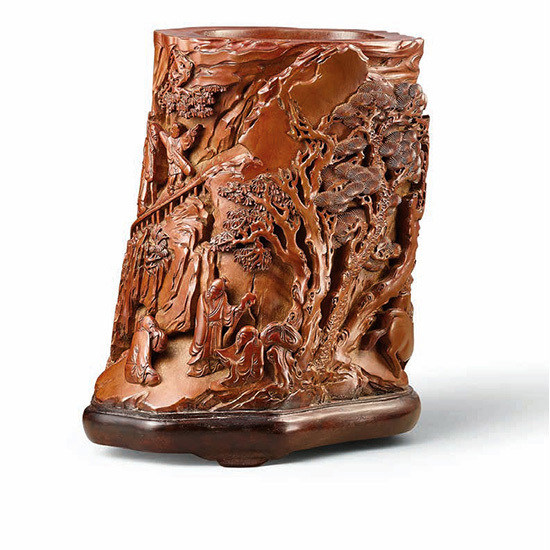 Another related boxwood brushpot of cylindrical form, signed by Wu Zhifan, is published in The Selected Handicrafts From the Collections of the Palace Museum 故宮博物院藏工藝品選, Beijing, 1974, Catalogue No. 88.